Once again this week we have been restricted on our movements due to the weather. Whilst most of you in the north may have been snowed in over recent months we are flooded in! The wet season here has been a good one so far, as the cyclones have caused minimal damage and the land has received much needed rain. I suddenly realised that mostof you may not realise how remote we are in Broome. We have a road north that eventually gets to Darwin, which is about 2000kms and our closest town is Derby-over 200kms. We have a road south that eventually gets to Perth, which is over 2000kms and where all of our supplies come from. The closest town to the south is Port Hedland-over 600kms, which is also a small coastal town. Our location meant that during the height of the pearling industry here the Pearling Masters sent their “whites” to be laundered in Singapore by sea, as that was the fastest option! We avoid wearing white nowadays, as the pindan red sand is not white friendly! Most people fly from Broome and we are well serviced by several airlines. Of course the shorebirds do the same! 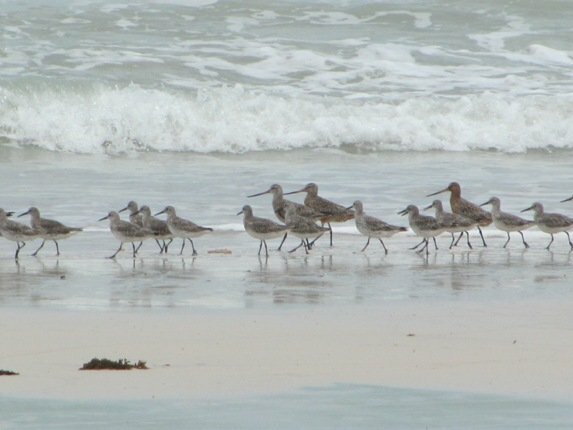 In coming months the shorebirds will depart and head north to Bohai Bay, which is about 6500kms from Broome. They will feed up there and then head north to Siberia to breed. The shorebirds are starting to get their breeding plumage and the first to show some colour are the male Bar-tailed Godwit. We were able to get to a beach just to the north of Broome this week to observe shorebirds, as Roebuck Bay is still not accessible because the dirt road is flooded. In recent years there has been some incredible discoveries relating to the migration of shorebirds out of the Broome area. An individually marked Great Knot was seen in Roebuck Bay and then observed on the mudflats at Yalu Jiang Nature Reserve, China, 137 hours later! It was observed sleeping after the 6400kms trip. For a researcher to get from Broome to Beijing it would take over 30 hours, as you would be required to fly south first! You would then have the joy of the traffic to get from Beijing to Bohai Bay, so the birds do make an incredible journey which ever way you look at it. 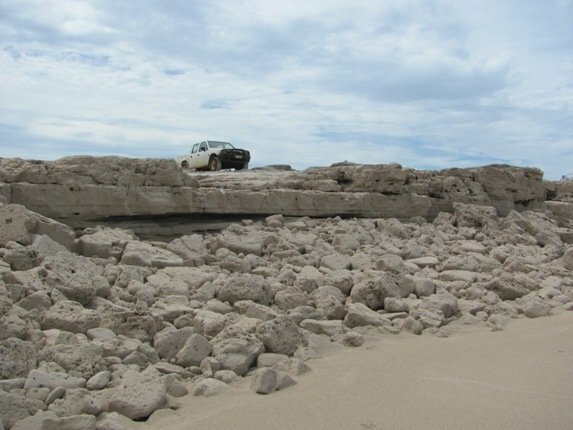 The erosion caused by the recent rough weather has been rather pleasing that it has prevented vehicles from driving onto the beach. There is a tendency for some people to drive onto the beach “just because we can” and have little regard for the nesting turtles and birds. A vehicle realises it can no longer drive onto the beach! 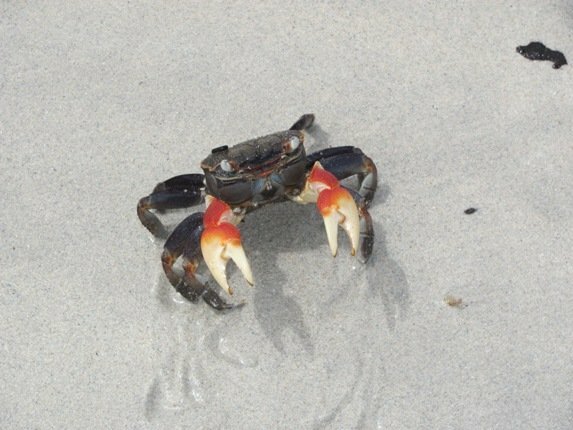 Of course you will always see more than birds on the beach after a storm and this crab acknowledged our presence. 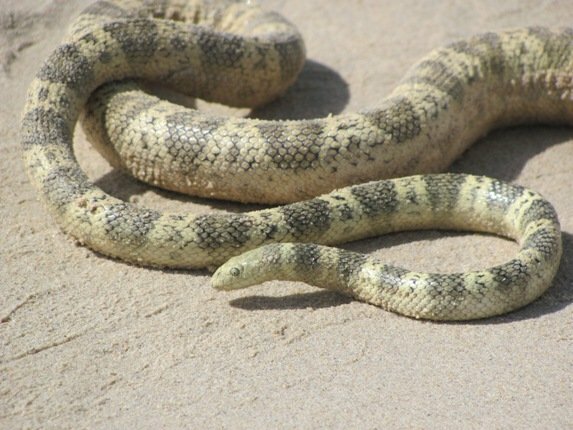 We also came across a Stoke’s Sea Snake that was a rather nice specimen and would hopefully remain in the sea after the next high tide. It is not uncommon for them to be washed in during a storm, especially if they are pregnant. 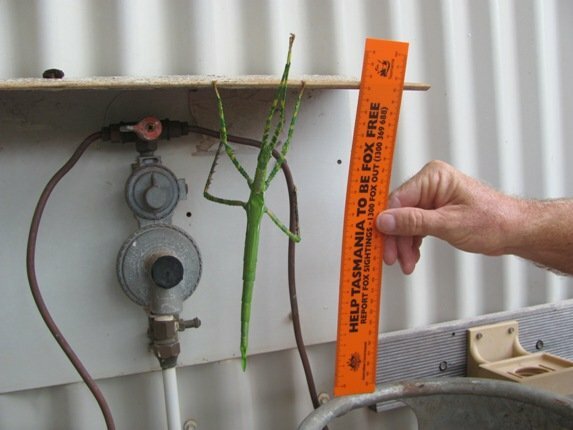 The big excitement this week in our garden was a rarely seen Phasmid. This one was a superb specimen at close to 30cm and was next to our gas bottles. We relocated it to a native tree, so it was better camouflaged and protected. Even if the roads are closed there will be something of interest close to home! Great Post Clare! We also live in a sort-off remote area; our Pululahua crater isolates us from the rest of the world but we are only 25 km north of Quito. The access is a bit difficult so most people stay out. @Jochen-still more dangerous creatures here-sadly we had someone in hospital in a bad way after an irukanji jellyfish sting this last week, so I am keeping out of the sea. 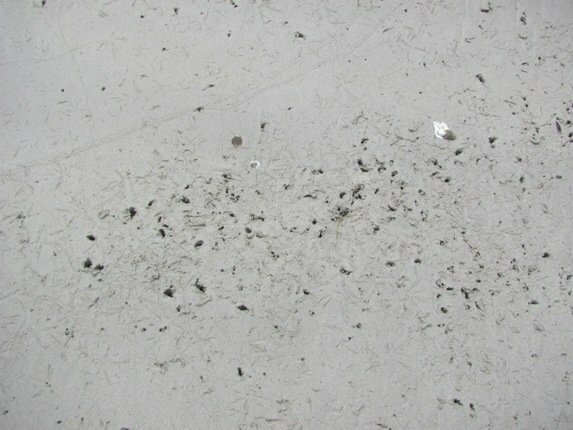 These little guys are very hard to see let alone photograph. @Renato-it is very much “long distance views” into the remote here, which I guess you don’t get with the tall trees! We can see forever-well, till the curve of the earth anyway! A great post, thanks Clare, always great to see some of our local critters being documented. We are remote but what a great lifestyle! Thanks “Broome Accommodation”! Hope you have experienced the amazing bird migration out of Roebuck Bay during April-if not-you need to!! Sunset and bird migration is a sight to be seen!